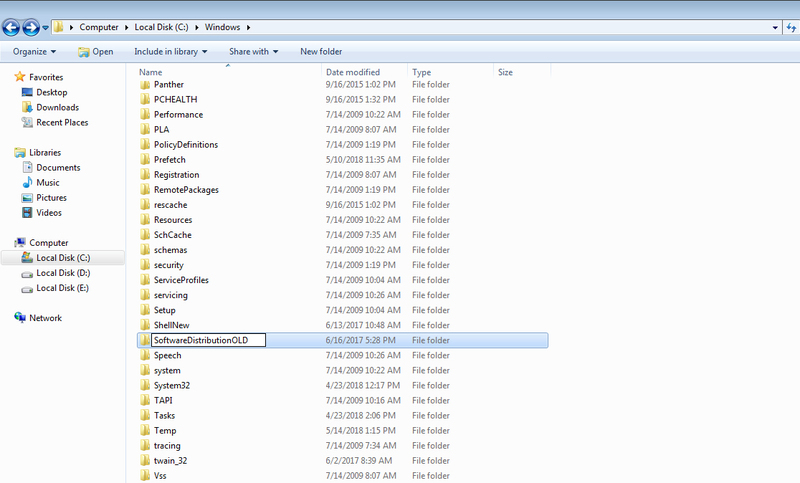 Method 2: Rename Windows update folder. Windows update error code 0x80070003 is among the most typical Windows error. You are likely to experience when using any type of version of Windows operating systems consisting of Windows 10. Windows error code 0x80070003 is an update-related error. You could come across the error any time when your pc is automatically installing updates whenever they are readily available or when installing updates for a particular application manually. This can additionally take place after updating your OS to Windows 10 despite whether you are using a PC, laptop or tablet. Insufficient space in installation disk. Click Start and go to Search Box. Type “cmd” in the search box before hitting Enter. Type “sfc/scannow” to stat system scan. This approach checks your computer system for any type of problem(s) that can trigger the error. You have to let the scan to finish because it can take a while. You should restart your computer system to see whether the error 0x80070003 is repaired. Open “My Computer” and navigate to “C:\Windows” folder. Find and right click on “SoftwareDistribution” folder and choose rename. Rename the “SoftwareDistribution” folder to “SoftwareDistributionOLD” and press Enter. Ask “YES” to UAC warning and continue to next step. Start Windows Update service, and try to update your computer. You may encounter the error because of minor issues with Windows Update. Type “troubleshooter” in the search box before hitting Enter. Select “Troubleshooter” and click “View all”. Select “Windows Update troubleshooter” and follow instructions that you receive on the screen. This method recovers your computer system to settings of an earlier date when it operated correctly. System restoration eliminates all updates and recently installed programs and applications however protects your files. Click “Start” in order to access “All Programs”. Navigate to “Accessories” before navigating to “System Tools” and selecting “System Restore”. Select “Restore computer to an earlier date” in the dialogue box that appears before clicking “Next”. Click on a restore point date from the list presented before clicking “Next”. The automatic system restore should start after which your computer will shut down to restart again. This method should most probably help you to get rid of Error code 0x80070003.